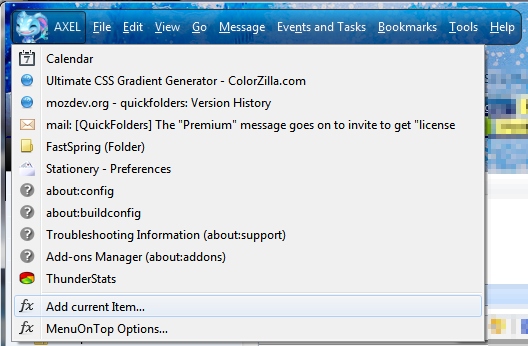 Menu On Top is a small extension which makes it possible to style Thunderbird and Firefox main menu. Detail on how to use it and screenshots are here. Fixes the wrong position of the Menu in Interlink. (was shown underneath main tooplbar, now on top). Note that the options "Show Tabs in Title" is currently unsupported. Made compatible with Thunderbird 66.0b1 and current version of Pale Moon. Added new darker orange color choice 'fire'. Improved positioning of status bar icon when it is configured - navigation bar is only used as a last resort, the configuration button tries to install itself into the status bar if it finds one. Added cleanup code that hides the Status bar icon when uinstalling / updating. Made compatible with Thunderbird 63 for testing migration process of a restartless Add-on. I am planning on making compatible versions of my other Add-ons QuickFolders quickFilters, and SmartTemplate4 as well but this will take some time - I am planning a developer hangout where I am hoping to get some help converting one of these as an example for existing developer of legacy Add-ons. If you are interested, please subscribe to my YouTube Channel Thunderbird Daily to get updates on these efforts. Photon Default - standard for new Thunderbird 60 theme with bright backgrounds and dark text. Photon Dark - dark flavor for new Thunderbird 60 webextension themes with bright text and dark backgrounds. Changed Radius settings from em to px because Thunderbird removed the em binding in XUL input items. Added new Avatar Icon for Thunderbird 60. Slight improvement with not affecting border width when "colors only" is selected. Important news: This addon will not work from Firefox version 57 as XUL / XPCOM based addons are officially not supported anymore. To keep using MenuOnTop you can install Waterfox (recommended), Firefox Pale Moon or SeaMonkey. These are all browsers based on the Mozilla open & free codebase. To install, maked sure to enable extensions.legacy.enabled = true in about:config. Removed obsolete references to nsIPrefBranch2. These would break when reading settings in Thunderbird 57. Removed version options from script tags which also broke settings in Thunderbird 57 and later. 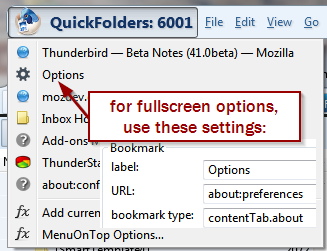 In Firefox: If a tab is already open in the current window, set focus to it instead of opening a duplicate. Made sure the new tabbar top-spacing setting from version 1.4 works in Firefox too. Added setting for spacing to tabbar when not in maximized mode "Tab bar top margin"
Make sure that icon height overrides max menu height. When selecting a new flavor (which has a specific maximum menu height), and an Icon is active, then the maximum height of the men will not fall below the size value given on the advanced settings page. Added Firefox and Thunderbird icons and also Halloween ones. Of course you can still use the League of Legends avatars which were distributed with the previous version. Font size and bold attribute for custom menuitem. Improved instant loading of settings on update. Added lop-left bookmark feature, use it to store your most important web pages, single messages (Tb) and mail folders (Tb). This is a handy and quick way of keeping only the most important bookmarks within easy reach without wasting screen space. Just activate the option in advanced, and enter a label of your choice. The new menu will show up beside the "File" menu. Navigate to any web-page or open an email, open a single message tab or click on a Folder, and then choose "Add current Item" (Thunderbird) or "Add current Webpage" (Firefox). This is a space-saver for when you do not want to permanently show your Personal Bookmark Toolbar. So ultimately this will unclutter your Mozilla experience! Added Avatar Icon - choose an image to represent your profile. I have added some icons of League of Legends and Borderlands characters, created from images I found -these are under fair use and I have added license information and links in the "avatars" subfolders where they are stored. icon size settings: for small and normal size. To do: improve css tidy up routine - disable only works once in a session. Persisted statusbar icon across sessions. Reuse preferences window if it is already open. Menu will now be made visible automatically when Addon is installed or updated. It just moved the menu to the top, no configurable options.